Whenever someone interacts with your Facebook Page on Messenger, they will be added as a subscriber. To view your Messenger subscribers, you will need a Messenger tool like ManyChat. This can be done on a free or pro ManyChat subscription. Log in to ManyChat, and click on the "Audience" tab. This will bring up your list of subscribers. Click "Filter" to sort by various factors, including tags, and the sources your subscribers opted in through. You can also perform actions at this page such as unsubscribing users, or exporting your list of Messenger subscribers. How To Use My Messenger Subscribers? Your Messenger list is much like an email list. There are many things you can do to maximize the value of your list. Here are a few actions you can take with your Messenger list. To view a more in-depth article on Messenger marketing, see this article. You may want to add default sequences that are sent to your list after subscribing, or after a certain length of time. Go to "Flows" or "Automation" in ManyChat to draft and enable Messenger sequences. You can send one-off broadcasts to your Messenger list. Example use cases may be new product launches or seasonal promotions. Go to "Broadcasting" in ManyChat to write and schedule a broadcast. 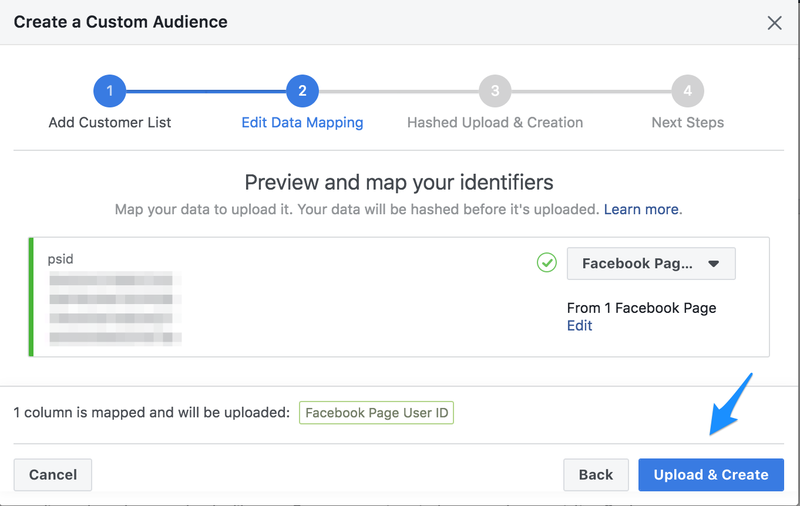 Your Messenger list can be very useful when setting up a new audience for your Facebook Ad campaigns, as your list is likely to be made up of people who have shown an interest in your products or brand, and even gone so far as to engage with your ad/page. 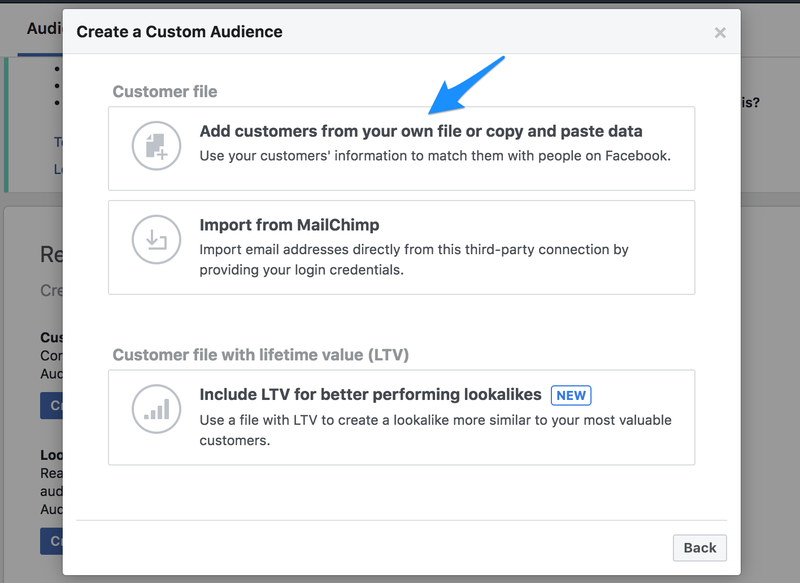 You can choose to retarget these users, by exporting them to create a Custom Audience, or use the list to find new users by creating a Lookalike Audience. To do this, first export your list from ManyChat. Go to "Audience" to view your entire list of subscribers. Segment the list if you wish, and click "Bulk Actions", and "Export PSIDs". Note: you will need a Pro ManyChat account in order to export your subscriber list. Once completed, it should show you a button to download your list in a .csv file. 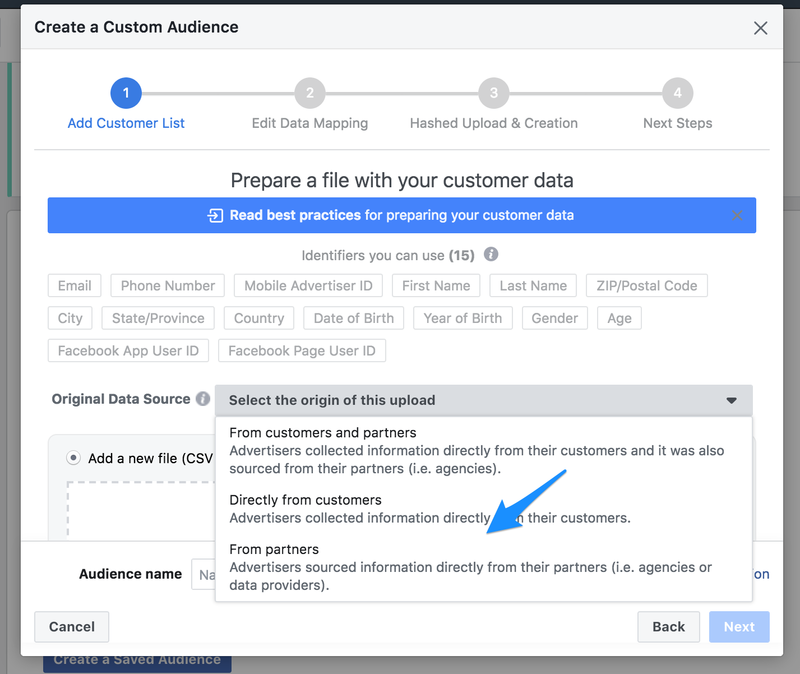 To upload this file as an audience, go into Facebook Ads Manager. Under "Assets", choose "Audiences". Clicking on this will bring up any audiences you have previously created, and give you the option to create new audiences. 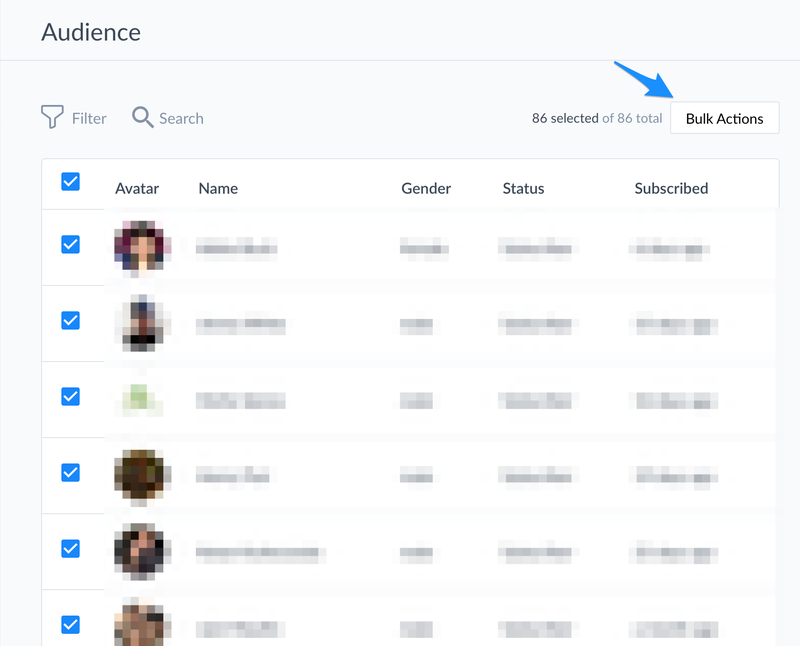 Choose "Custom Audience" to create a new audience. 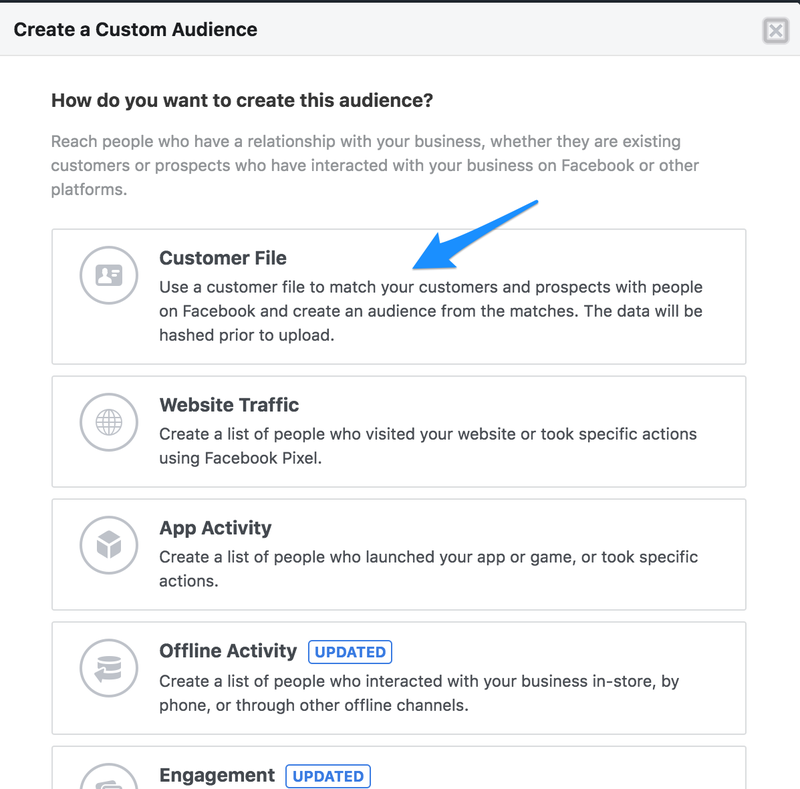 When asked how you want to create your audience, choose "Customer File". On the next prompt, choose "Add customers from your own file". Moving on, you will see a box marked "Original Data Source". Click on the dropdown menu and select "From partners". Now upload your file, and click next. You will arrive at a step saying "Preview and map your identifiers". Click on the dropdown menu and choose "Facebook Page User ID". Next, you will need to click the link underneath that says "Enter Facebook Page IDs". 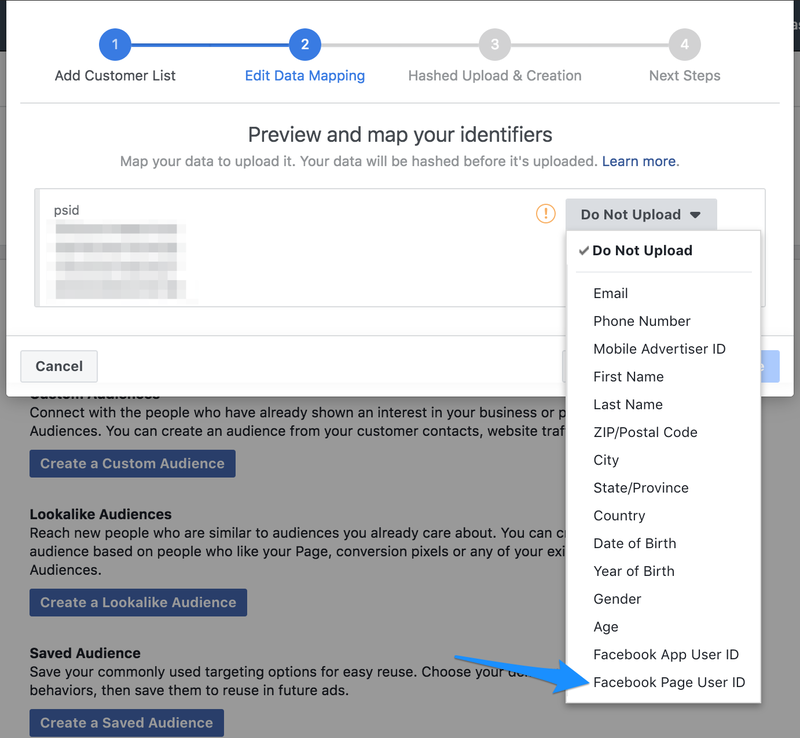 Here, you need to put in the ID of your Facebook page (the same page your list is subscribed to), to ensure you have the authority to use this customer data. You can find your Page ID under the "About" section of your Facebook page (near the bottom of this section). Add your Page ID, and when you're done hit "Upload & Create". Once you have a Custom Audience built, you can also create a Lookalike Audience. These type of audiences are great at growing your reach, by putting ads in front of people with a similar profile to those already on your list. To create an audience, choose "Lookalike Audience" from the "Audiences" page. You will need to choose a Custom Audience to base the new audience off. Choose the one you've just created, or another if you wish. Next select a location, or locations to target. Finally, select your Audience Size. 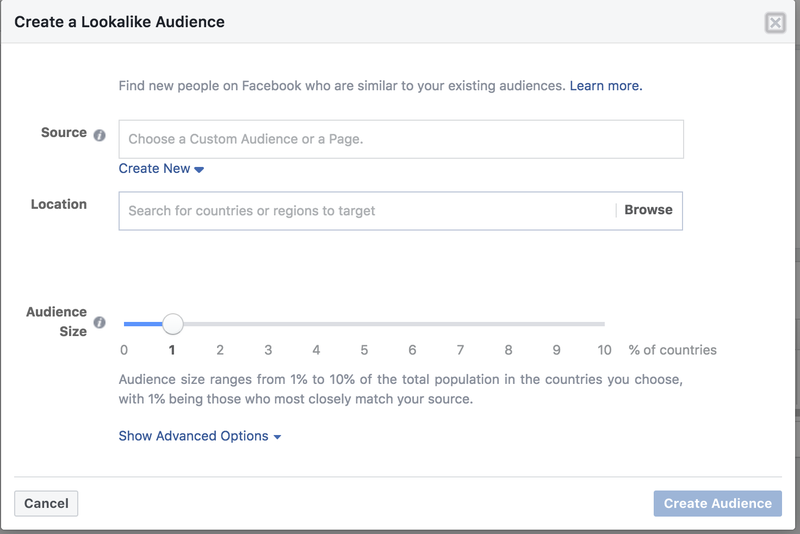 The slider allows you to choose from 1-10, 1 being a narrower audience more closely related to your original list, and 10 being broader, yet not as closely linked. Fill in these three steps, and you can create your Lookalike Audience. Be sure to test different audience compositions, until you get the recipe that is best suited for your business.